Sorry, I have been absent from posting lately. Between getting a new computer, our internet down and caring for our doggies, it has been difficult to post. I recently had a luncheon for our Clogging ladies down by our pool. It was a tropical theme, so I decorated the event with lei's, flowers, grass table skirts and colorful dishes. I will share a few more posts with the party pictures soon. I also will be posting this new recipe site I found. It lets you add your recipes and it puts them in a tidy little box. Great for printing and social media sharing . You can add your own recipes or collect some. Create a cookbook, etc. I created these flip flop sandal cookie with Nutter Butters. They are so easy and so darn cute. The flip flops turned out soooo cute, Linda. I just bought some Nutter Butters the other day to make another cookie craft with my grands. I'll post them later after we make them. Those are the cutest little treats, Linda...best of all, pretty simple! So cute Linda..I love your whole party personality.. Happy to see you back..hope the doggies are doing well. 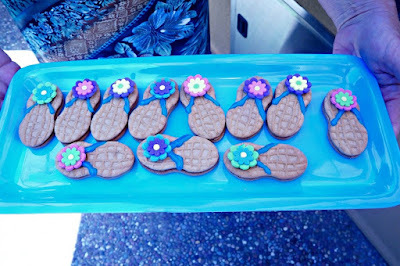 Hi Linda, what a cute idea for a beachy style cookie. They look amazing. Hope all is going better now for you and the pups. Have a great day. How cute are those! Hope the party was a big success! Those are so friggin' cute! These are so fabulous, Linda. I didn't even know what nutter butter was and now I have to have these for my next party! What a great idea. I can't wait to see the rest of your party. You're such a wonderful hostess!